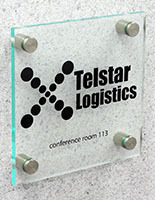 Door Signs complement any office environment! 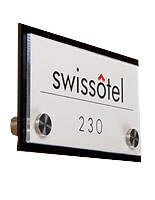 These office signs offer a decorative way to personalize your business interior by adding a little color to the structured corporate environment of office buildings. These door signs provide design flexibility. 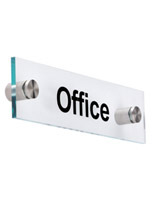 If an office room changes occupants, save time and money by replacing an insert, not the sign! We manufacture these signs for sale in a number of sizes to offer customers the most choices. 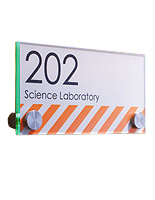 Create and print your own custom door signs onto the supplied film. 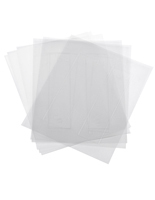 You have your choice of using either clear or frosted film sheets. 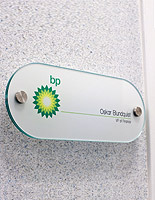 Download a template of your choice and add text, images, and/or logos to create your name plates. Carefully separate print from pre-scored sheet and sandwich the assembly between two green-edge acrylic plaques. Mount the standoffs to the wall and screw the door signs together. 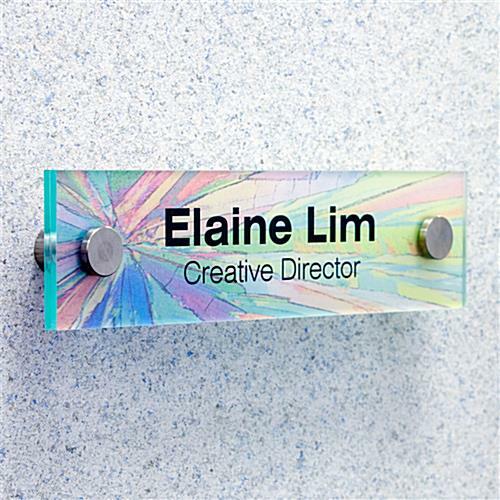 Door signs, such as office signs and name plates, will never look the same again. Buy today! We purchased 60 of these wall signs for each door on our school property. It is an awesome upgrade to our school. The great thing about these signs is if a teacher changes classrooms in the summer we can simply change out the signage for the room. That's so great to hear, Andy! We're so happy we could offer what you needed. Thank you for the great review! The specifications for this product include that the print film must be used with laser printers, not ink jet. OK, no problem, our office uses laser printers. Unfortunately, what they fail to specify is that the high-volume laser printer/copiers used by most professional offices operate on too high of a heat, which results in low print quality. The trick is: under paper source, make sure you are using the "transparency" setting. This brings the temperature low enough that printing is of acceptable quality. 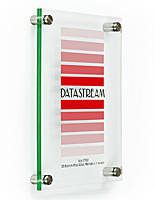 The quality of the product was excellent and we received it faster than we ever expected. We will surely use this company for all of our nameplates. Thanks for the great review, Laura! We're so glad these door signs worked well for you! This sounds great, Christina. Thank you for your feedback -- we appreciate it! We are very sorry that you weren't completely satisfied with your order, Dirk. If you would like to discuss returning your order, feel free to contact our customer care team and they will be happy to help solve your issue or handle your return.